Simplify and streamline your quality improvement with smart inspect at ESCFederal. Easy to use, completely digital, and customized for you. We are relentlessly committed to providing clients with unparalleled value, service, technology, communication, response, action, and follow through. Even the smallest details are measured, managed, and perfected—from our best service practices and our state-of-the-art green cleaning methods, to our advanced quality control and reporting. To us, quality assurance is more than a catchphrase, it’s the way we do business. That’s why we use mobile and web-based software to track inspections and monitor performance measures that are designed for individual facility’s exact specifications. From the condition of the property to the acquisition of specialized equipment, we measure every detail of performance and quality to ensure that we deliver no less than world-class service. Quality assurance is of the utmost importance to us at ESCFederal. We are dedicated to providing each of our customers with state-of-the-art, web-based quality management and inspection technology. Inspections are performed with smart phone devices that are loaded with customized SmartInspect software that has been configured to your facility’s exact cleaning specifications. Receive automatic notifications of site activities and other messages important to the management of cleaning and maintenance operations. You don’t need an in-house IT administrator to manage and use SmartInspect at ESCFederal. The system is completely web-based, digital, and secure. No software is installed on your computers and backups are automatically managed by the system off-site. Everything is Digital – Go Paperless! SmartInspect standardizes quality management across large or multiple properties. Live data is instantly available, communication is streamlined, and deliverable results are at your fingertips. Simply touch the device’s display screen to select locations, buildings, rooms, and area types specific to your facility. Data is stored electronically and updated instantly when changes are made, and remains available to all users with just a click. 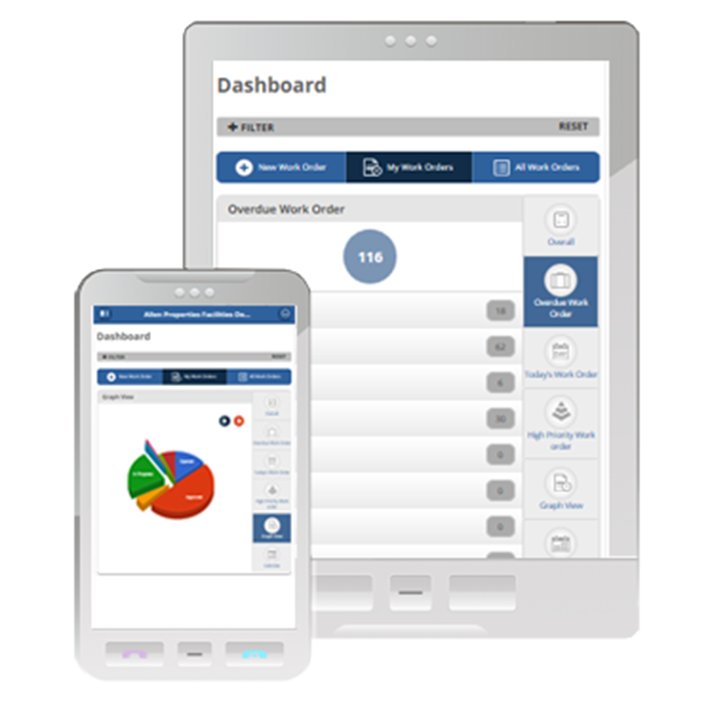 Simply log in to your account to view a variety of useful reports designed to make your day-to-day operations more efficient. Computerized Maintenance Management System (CMMS) has never been easier or more accountable. We believe technology should be helpful, efficient, and easy to use. That’s why we use NetFacilities to track preventative maintenance on machinery and equipment, customer requests, notifications, status, and completion of all work orders in a single, easy-to-use application. NetFacilities is completely web-based for real-time access available to tenants, staff, management, and appropriate field employees. In addition to simplicity, NetFacilities delivers powerful productivity analysis so you can track time and efficiency to help process improvements.